Day 25. 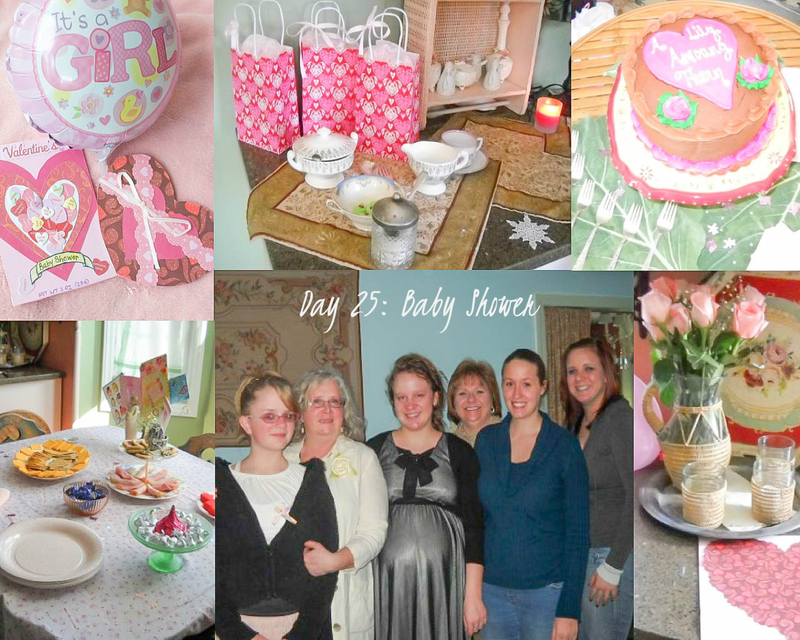 Baby Shower/Blessing: Share a photo from your baby shower or blessing. Maybe you could show everyone the gifts you received that you were not able to use. On Saturday, February 13, 2010, my mom threw me a Valentine's themed baby shower at my house. I was 35w6d pregnant. Everything was pink for my sweet little princess. I made the baby shower invitations. During my pregnancy, I got really into card-making. I spent hours on the floor in December making Christmas cards to send to basically everyone my family knows. The top left photo shows the two invites that I sent out. I kept two for myself and am so thankful I did. They are now in Lily's memory chest. One of the invitations was supposed to look like a heart-shaped chocolate box and the other one was supposed to look like a sweethearts candy box. On the back where there is nutrition information on candy, I had information about the shower. Also pictured in the top left photo is the "It's a GIRL" balloon from my shower that I keep in my memory chest. The bottom center photo is of everyone that was at my shower. From left to right: my sister Emma, my mom, me and Lily, Jean, Sarah, and Stephanie. At that time, I had moved back to North Carolina recently and didn't know many people in the area, except those from years ago when I lived here. So not many people were there. I invited more, but lots of my old friends were away at college or had moved to another state. I got that dress at the Love in Bloom maternity store, which was across the street from the hospital where I had my prenatal appointments and where Lily was born. I also wore that same dress to Lily's Celebration of LIFE Service, about a month and a half later (in picture for Day 3). The bottom right picture is of the pink roses that were on display at my shower, which I dried out and now have hanging on my bedroom wall. Also pictured is the scrapbook pink paper with a heart that everyone wrote a message to Lily and I. I now have that in Lily's scrapbook, with all things from my pregnancy (I also have another scrapbook for hospital photos, service photos, etc.) I also have saved lots of other things from my shower, which will go in my scrapbook (I guess it's sometimes good to be a packrat). ;) It is a work in progress. I found lots of adorable stickers to go in the baby shower pages. I even used some saved wrapping paper from my shower as the background pages in the scrapbook! I still have a lot of things that were given to me as gifts at my shower and can't picture giving them away or selling them. I was so proud to show off my big baby belly (even though my face and everything else was getting really swollen at that point). We had lots of fun playing games and video recorded some of the shower. Some of the things people said were so funny and make me smile to go back and watch/listen. I am taking some of the quotes of what people said and using it in her scrapbook. One of the games we played was people used toilet paper to guess how big around they thought I was and then they held it up to my belly to see how accurate they were. My sister and friend Sarah both got it exactly right! Some were way too long and I was like, Geez, how big do I look?! Haha. I saved that piece of toilet paper that was the correct guess and am so glad I have it. My shower was so much fun and I am so thankful for these precious memories with my sweet girl! It was a happy time and I treasure those happy memories. Looks like a wonderful party in honor of you and Lily! Congratulations on the Blogoversary I have been so helped and touched by your blog! You have helped me more than you will ever know,really. I pray God uses you to help many other hurting mommies. Lily and Luck have a wonderful legacy!